You can never know in advance all the news that will move the market in a given week, but some things you can see coming. From a pair of PC giants struggling to remain relevant in this mobile computing market to the leading Internet radio provider checking in with what should be its first quarterly profit since last year, here are some of the items that will help shape the week that lies ahead on Wall Street. Monday -- What About Bob? 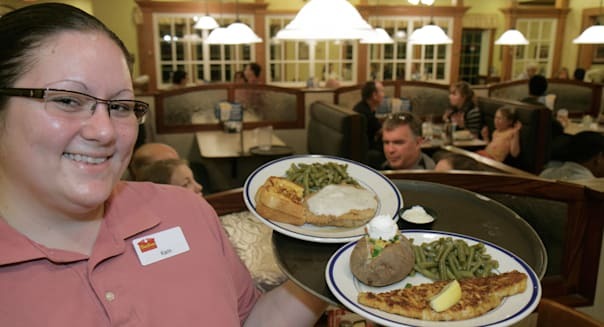 : In a time when casual dining restaurants are struggling to compete against nimbler fast casual chains, Bob Evans (BOBE) is a throwback to the days when comfort food was in high demand and calorie counts were readily ignored. Sure, patrons at any of the 560 namesake restaurants can order off the "Fit From the Farm" menu (where items pack 650 calories or less), but we know that most folks walking in are craving the pot roast, mashed potatoes, and pork sausage that the company also distributes prepackaged, refrigerated and frozen at a supermarket near you. Bob Evans reports on Monday after the market close. Don't be surprised by a sharp drop in revenue. It's not Bob Evans' fault. The company sold its Mimi's Cafe chain in a $50 million deal earlier this year. The key here will be how its namesake chain is doing -- and if Bob Evans is holding up better or worse than its meandering peers in casual dining. Tuesday -- Penney Loafers: It's hard to find a retailer that's doing worse than J.C. Penney (JCP). Ex-CEO Ron Johnson's ambitious makeover backfired last year, and after several horrendous quarters he was finally sent packing earlier this year. The good news for the struggling department store operator is that the bar for success is now lower, as the chain's performance is stacked against last year's dreadful plunge in same-store sales. Yes, things could get worse. Reports earlier this month claimed that some suppliers were starting to scale back shipments on credit concerns, but J.C. Penney refuted the allegations. We'll get a clearer snapshot on the retailer's chances to turn things around when its interim CEO reports quarterly results on Tuesday morning. Wednesday -- The HP Weigh-In: After seeing Dell's (DELL) privatization soap opera play out in recent weeks, larger PC maker Hewlett-Packard (HPQ) may feel lucky that it's the one that wants to continue trading publicly. Yes, things are ugly for companies thinking inside the box. Industry tracker Gartner has reported five consecutive quarters of declining shipments of desktops and laptops as consumers switch to tablets and smartphones. Unfortunately for Dell and HP, both companies have struggled to make a serious dent in either half of the mobile computing market. They have held up better with their servers and their businesses services, but it's hard to get excited about Dell and HP. The market will get an update on the industry when HP reports on Wednesday. Thursday -- Island In the Stream: Streaming music has become a big business, and Pandora (P) is leading the way. There were 71.2 million active Pandora listeners last month, up 30 percent over the past year. They are largely consumers of the free ad-supported platform. Pandora hasn't been able to grow its premium subscriptions the way that some of its smaller rivals have achieved, but it's hard to scoff at a platform that's serving up 1.3 billion hours of content a month. It's hard to make money with the steep music royalties that Pandora has to shell out for every stream and Pandora has posted back-to-back to quarterly losses. However, analysts see Pandora returning to profitability when it reports its next round of quarterly financials on Thursday afternoon. Friday -- Footloose: There may be a perfectly reasonable explanation as to why Foot Locker (FL) employees are dressed like referees, a necessary nuisance at sporting events. With 3,500 stores across 23 countries, it's easy to argue that the shoebox-wielding refs are winning. Foot Locker wraps up the trading week with its quarterly report on Friday morning. Some retailers aren't holding up so well in this gradual economic recovery, but this athletic footwear behemoth isn't one of the stragglers. Analysts see sales and earnings growing 7 percent and 26 percent, respectively, at Foot Locker. Motley Fool contributor Rick Munarriz has no position in any stocks mentioned. The Motley Fool recommends Pandora Media. Try any of our newsletter services free for 30 days.